Tupperware Brand and Working Mom are having a party and you can be invited! Tupperware is celebrating their 45th Anniversary and will be giving 45 women an exclusive Tupperware party. If you want to be the 45 women to join their 45th Anniversary party you just need to join thier promo. Write a good story of how Tupperware makes things easier. Send your name, complete home address, mobile number and occupation. 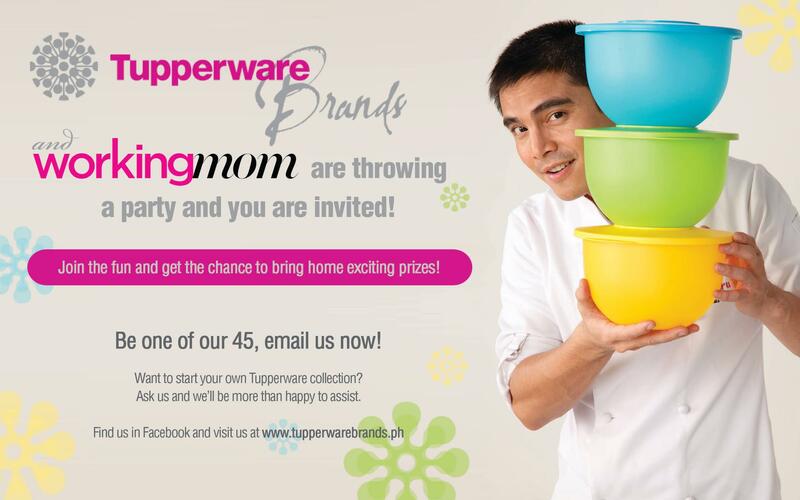 Send your entry to workingmompromos@gmail.com with the subject “Tupperware promo”. Tell if you have a Tupperware dealer serving you at the moment or have lost contact with her. Deadline of entries is on October 7, 2011. Working Mom representative will be emailing the details for the 45 lucky women that are chosen to attend the Tupperware Party.